← Togainu no Chi: Ep 1-The Blood Seemed A Bit Too Bright. So first off Aizen is sentenced to the lowest underground prison level for 20,000 years… and with that peace returns to Soul Society. Apparently, the umm 1st captain (whatever it was his name) lost one arm. Zaraki, Byakuya and Kyouraku lost their captain robes lol Hinamori is under threatment for her lost organ… Hitsugaya goes to training…and nooo omg apparently Gin died T_T sigh then what about Ichigo? well, unlike what i expected.. there was no hollow ichigo arising he just fainted and slept for a month o.O They said that Ichigo fainted because his reiatsu was stabilizing from his lost shinigami powers… and little by little he will no longer have any spiritual powers. 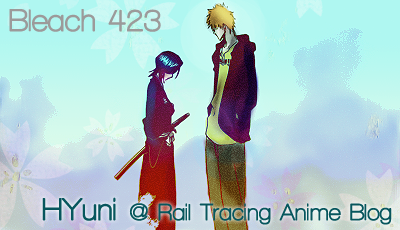 So.. *sob* at the end of the chapter Ichigo says his goodbyes to Rukia T_T… and that’s it. End of the Chapter. Can this really be the end? Nooo… Ichigo can’t be separated from Rukia! He will surely manage a way to get back his power. That’s why Tite is taking 2 weeks to think how is he goin to do that (that’s right a hiatus)XD Sigh.. at the very least, I hope Ichigo doesn’t end up with Orihime (can’t stand her). This entry was posted in Bleach (Manga), Manga, Reading Right Now and tagged bleach, Ichigo, rukia. Bookmark the permalink. depressed from something that happened in this chapter?